NAVIGATION: Home » Frequently Asked Questions (FAQ) » What Are Deliberative Assembly (IQA) Operating Design Features? The IQA has been given the power to adjust its operations to accommodate change. This will be essential as the system evolves. In particular, this constitutional Amendment only constrains the IQA to abide by the Constitution, gives it authority to manage Initiatives in an appropriate manner, protects it from outside influence, and allows it to function more or less without Government interference. The IQA can vote to change its Rules except for a small group of rules, whose proposed changes the IQA must seek from the Electorate by Direct Initiatives. It is recommended that, before making any changes, the IQA should first re-adopt the IQA rules, as deemed adopted in the Amendment, to substantiate its independent authority. National assemblies range from about 300 to 660, with an average of about 480. They have evolved over centuries to these sizes and give a rough guide about the number of members that are large enough to represent all the people in a nation and yet small enough to be manageable. The State with the least population is Wyoming with just over 501,000 vs. a U.S. population of 291,000,000 (2003 estimates). For this State to be guaranteed that on average it will have one IQA Member, there will have to be 580 or more Members. Therefore, 600 is an appropriate upper bound for the size of the IQA. If the IQA has 480 Members, then Wyoming would be without representation on average 17 percent of the time, and the District of Columbia for 7 percent of the time; all other States would have on average one or more Members from their State. iii. select Initiatives that will probably pass so the Electorate do not have to waste their time on unwanted Initiatives. The current US population is over 300 million, of whom about 190 million are citizens of voting age, 125 million are registered to vote, and 100 million actually vote. The typical sample size for a Gallup poll which is designed to represent this voting population is 1,000 national adults. For example, with a sample size of 1,000 national adults, (derived by telephone calls to create a simulated random selection), the results are highly likely to be accurate within a margin of error of plus or minus three to four percentage points. The knee of the curve occurs at about 500 Members—increasing survey sample size above about 500 yields fewer and fewer accuracy gains. The key to an accurate poll is to get a good random sample. The IQA will probably comprise a better random sample than most polls because Members have an obligatory duty to serve. In a telephone poll, those of a certain temperament or whose time is most valuable often decline since there is no penalty. They must be replaced by someone else, but their replacement does not have exactly the same opinions, and so there is a built-in distortion of the randomness. The adequacy of the IQA size to achieve a required level of statistical accuracy will be tested in practice. The vote of the IQA on an Initiative can readily be compared with the vote of the Electorate. If there is a substantial difference then it is an indication that the number of IQA Members should be reconsidered. On the other hand, if it is very close, then the number of Members may be too high. Over time the optimum number of Member can be fine-tuned as necessary. 600 Members would accurately reflect the Electorate’s wishes to plus or minus 4 percent in 95 percent of the cases (e.g., for 19 out of 20 Initiatives). This is the accuracy and confidence level achieved in most nationwide political polls which do not have quite as good a random sample. On the other hand, reducing the size of the IQA by a fifth from 600 to 480 degrades the confidence interval by an eighth, from ± 4.0% to ± 4.5%. 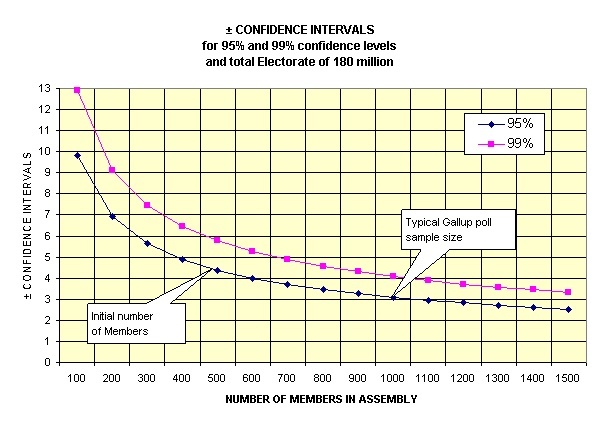 The National Assembly low-size of 300 would have a confidence interval of ± 5.7%. This is about 50 percent worse than a good polling sample, but it would be more manageable and would be appropriate to use as the lower bound for IQA size. The IQA Members’ voting accuracy will degrade somewhat if the Courts excuse many Members from their obligation to serve on the IQA or if Members are absent for the votes. It is apparent that taking longer between the two votes can give greater accuracy, up to almost 50 percent improvement with a one-year interval. A more rigorous statistical analysis will refine these numbers but not the general conclusion. Nevertheless, reducing the IQA size from 600 to 480 Members is approximately compensated by a three month delay between votes. No one can predict how many source Initiatives will be published, and how the rate of production will vary over time. There will probably be an initial flurry of activity, to which the IQA should not over-react; subsequently, the rate will probably level off to a fairly uniform level with occasional peaks. One reference point is the State Initiatives. In California between 1976 and 1996, there were 106 statewide ballot initiatives, or an average of about ten and a peak of eighteen every two years. Speculation is that there may be on the order of 500 worthwhile proposed Initiatives per year—i.e., excluding those that are duplicative, trivial or disingenuous. Based on five days in Session per month, each IQA working day about ten new proposed Initiatives will be processed. These will be reduced to about ten Candidate Initiatives placed before the Electorate every two years. By comparison, Congress (House plus Senate) has an average annual workload of about 4,500 bills introduced and 750 bills voted on. This indicates the different nature of the vast quantity of legislation produced in Congress compared with the few Initiatives that should be put to the Electorate. Changing the number of days they work each month. Changing the number of Members between the minimum to maximum limits. Managing the backlog and setting priorities to keep the workload within the capabilities of the Members. Adjusting the minimum size of Citizen Groups that may propose Initiatives. It is initially set on the high-side to reduce the chance of an excessive number of Initiatives shortly after the IQA first convenes. Adjusting the Initiative Submittal Fee and the publication Media cost. This permits the IQA to adjust itself to accommodate a wide range of possible future fluctuations and eventualities within its constitutional authorization. Based on the above, the best starting size is probably 480, with IQA authority to fine-tune the number up between 300 and 600. 300 is the size of the smallest of the national assemblies listed above. 600 is the size of the largest national assemblies excluding the U.K. Selected primarily because it is the average of national assemblies in developed countries, so it will be manageable and adequate to represent the People. Slightly larger than the 435 members of the U.S. House of Representatives, but not by much. At the low end but acceptable for a reasonable nationwide poll given the quality of the random sample. Reasonably close to a large deliberative poll®*—e.g., the “National Issues Convention” conducted by the University of Texas January 18-21, 1996 and televised by PBS. Very close to the size of the Athenian Council of Five Hundred. If the IQA continues to use a monthly Member replacement schedule, 480 is divisible by 12 requiring a convenient “round number” of 40 members per month (plus any who have left before their one-year term was complete). Thus, it is unnecessary to round up or down to whole members. Otherwise, 500 members would be an equally acceptable starting size. Assuming that an Article V Convention of the States decides the final wording of the Amendment, they would have the power to increase the number of Members to 580-600 if they felt all States had to have one Member on average. Of course, they would also have to increase the budget accordingly. 84 percent of the population 25 years old and over have completed high school. 26 percent have completed 4 or more years of college and 21 percent hold bachelor’s degrees. 6 percent hold a master’s degree. 2 percent hold a professional degree (e.g., medicine or law) or other doctoral degree. 51 percent Female (vs. about 12.5 percent in Congress). 49 percent Male (vs. about 87.5 percent in Congress). 69.1 percent White (vs. about 88.6 percent in Congress). 12.5 percent Hispanic or Latino of any race (vs. about 3.4 percent in Congress). 12.3 percent Black or African American (vs. about 6.9 percent in Congress). 3.6 percent Asian (vs. about 0.9 percent in Congress). 0.9 percent American Indian or Alaska Native (vs. about 0.2 percent in Congress). 0.1 percent Native Hawaiian or Pacific Islander (vs. about 0 percent in Congress). The population under 18 years of age is about 25.7 percent, who are not included in the IQA. It is not feasible for minors to participate regularly at IQA meetings. At a minimum, their parents are fairly represented on the IQA and will represent their children. The IQA may take the initiative to seek out the views of the minors in some reasonable manner. Congressional membership is 12.5 percent female and 87.5 percent male; i.e., a compositional sexual bias in which males outnumber females by a factor of seven times. Congressional membership is 11.4 percent non-white, whereas the total non-whites make up 30.9 percent of the U.S. population; i.e., a compositional racial bias in which non-whites are under-represented in Congress by a factor of 2.7 times. Membership will change each month, so there will be constant change in available skill sets. Many skills will be available in small quantity among the Membership. However, essential skills that are unavailable from the Members will be obtained from outside consultants. For example, the operating design, development, and maintenance of the IQA’s computer system will be almost entirely contracted. Similarly, legal advice on the Initiatives and on IQA activities will usually have to be contracted. Nevertheless, Initiatives legal issues should usually be modest because the IQA is expected (but not obliged) to stay away from complex legislation, which is much more the business of Congress. One of the objections to the IQA concept is that randomly selected citizens will not be up to the job. The section on the Wisdom of the IQA shows that there is every reason to believe that it can do the job very well. The fundamental basis of democracy is that the voters can be trusted make reasonable common sense decisions; otherwise they would be better off with some form of dictatorship. Time and time again it is proven that they have a high degree of common sense, even though they may not have the education or prestige of the elite. A jury of twelve routinely decides on matters of life and death or make civil decisions involving huge amounts of money. The IQA will be forty times as large as a trial jury, and will have access to expert help and advice whenever it wants it. People rise to the occasion, and there is good reason to trust their combined judgment to act in the United States’ best interests—arguably more reason than those representatives who have been subject to influence of special interests groups and their lobbyists for their reelection and political careers. Members who are less able to read, those with various handicaps, and Citizens with English as a second language will serve an additional unique and valuable service by helping to ensure that the Candidate Initiatives are clear and comprehensible to the largest possible proportion of the Electorate. The IQA will operate as a deliberative assembly for much of its work. The term deliberative here means simply that, as compared with the People as a whole, the Members within the institutional context of the IQA will become better educated about the issues by information from various sources. They will split into smaller groups (Deliberative Task Forces) to discuss and refine their views, and perhaps modify their opinions if they do not stand up to debate. The deliberative process has been well studied academically and in polls. After the deliberative process, participants have more thoughtful and wiser views (BCCA, PBS, Fishkin, McCombs & Reynolds, et al). When the IQA places a Candidate Initiative on the ballot, their views will be attached. The Electorate will find their views to be well considered, and will generally pay them close attention, substantially offsetting mush of the hysteria raised in the Media. Such laws would be made by well-informed Assembly Members rather than a less informed Electorate. The problem of overburdening the Electorate is avoided, so the Assembly could pass many more laws than in the planned Solution. It is less consistent with the constitutional framework, where the ultimate authority and source of power to make legitimate final decisions is the People, not a random sample of the People—which is not mentioned in the Constitution. The adoption of an Initiative by the Assembly followed by a vote by the nationwide Electorate provides an effective check and balance that is entirely consistent with the Constitution. When the nationwide Electorate passes an Initiative, it psychologically and morally binds the entire Electorate to make their decision work, whereas passage by the Assembly has far less psychological and moral force and cannot expect the same public commitment. The voter assembly members are not as qualified as professional congresspersons to formulate the mass of complex legislation needed to run the country. However, they are far better qualified to ensure that the People’s interests are properly protected by means of the relatively small amount of initiative legislation that nationwide voters can assimilate. The initiatives are generated by both U.S. citizen groups and U.S. organizations. They will vary greatly in scope and quality. Many will be quickly eliminated from further consideration while others will be of professional quality and importance equal to any produced by government. The Assembly will obtain whatever information and advice it deems necessary and will advance those in the best interests of the People. Consequently, this Amendment Solution limits the IQA to managing only the choosing of the Initiatives, and the People make the decision to approve them or not. For jury duty, even though this is usually of short duration and does not involve being away from home for protracted periods, it is common for high-salary people to employ a lawyer to have them excused. Easy avoidance of duty is unacceptable for IQA Members, because they are chosen to be a representative sample of the Electorate. For example, excusing someone with a doctoral degree would mean that there is only one chance in 50 that a new randomly selected person would have similar qualifications. IQA duty must be regarded more in line with a conscript military duty, where absence without leave is punishable by time in prison. Therefore, excessive hardship must be proven in court to be excused IQA duty. Members will experience some discomforts and impositions. They will probably have little free time during IQA sessions. They will have to take leave of absence from their jobs for a part of every month for one year. They will not receive privileges such as college tuition for military service or veterans’ benefits. Consequently, they must receive a high enough compensation that the large majority of Members will not find it an unreasonable imposition. There is another important compensation—prestige and achievement. When the records are made public, if the Member wishes, a Members’ service will be acknowledged in the IQA records along with the accomplishments of that particular IQA period. An IQA culture will evolve to define and encourage this. Moreover, the IQA will offer to repeal this constitutional Amendment so the achievements of these years will be the early Members’ legacy to the nation. Voting on Initiatives will occur on every even year, concurrently with the federal election. This is the easiest and most economical frequency. However, if the people find Initiatives to be an important improvement to their democracy and if future technological advances make elections less expensive, it is possible that an annual vote will be more appropriate. One of the factors that will enter into the evaluation is the turnout of the voters. It may be that the Initiatives alone increase the turnout, or it may be that eventually some form of tax or other incentive will compensate those who take the time and trouble to fulfill their citizens’ duty to vote, and possibly penalize those who do not. After a thorough evaluation of the costs and impacts, the IQA has the authority to place a Direct Initiative before the Electorate to change the frequency. Two Initiative databases linked only by key(s) will be developed and maintained to track all proposed Initiatives and Citizens’ feedback through their progress. This will be needed urgently from the start. The external Initiative database will be public information readable from the Internet and conveniently organized. Publishers that have committed to publishing and reporting on proposed Initiatives will accept only the IQA standard forms, will publish them in that form, and will concurrently provide their data in electronic form to the IQA to build the external database. The internal Initiative database will be confidential, updateable, and accessible only to the IQA. However, it must be kept simple to use, as many Members will not be computer literate and will need help. It should use software with which the majority of those Members who are computer literate are familiar. A help desk should be provided and the more experienced Members will generally help others. An off-the-shelf SQL database engine should be able to provide basic storage and data entry capabilities in a few months if highly competent consultants are employed; refinements can be added later. If the newspaper(s) will provide their Initiatives sections in electronic form, which should be possible to arrange, this will help populate the database. The status of each Initiative should be tracked, and the drafts kept from the time of original communication through the various stages of rejection or to final ratification. The Initiatives must be given key words and phrases. They should be identified by primary index and search indices etc. A complete text search should be provided. Reliability, backup, security, virus Trojans, worms, protection, prevention of DOS attack, etc. are all important considerations, and at least one off-site backup is mandatory. The IQA’s web site should be placed with a large Internet Service Provider offering 24×7 service with redundancies and large Internet channel capacity. Only publicly published data such as the publicly-visible portion of the proposed initiative database should be housed there. It will contain Proposed Initiatives, Revisions, Comments, and other forms to enable citizens to propose initiatives in a standard format that can be automatically added to the database (but not submitted to the IQA except via the Publishers). The appeal of on-line democracy should be limited and expectations managed from the beginning to avoid multiplication of risks and potential for overload of IQA resources. From an early date, the external database should include a capability for Citizens to debate the issues—e.g., to comment on proposed initiatives or on other Citizen’s comments, and to participate in public opinion polls about the proposed initiatives (when this can be done reliably). The information provided in this manner will be used only to advise the IQA—the IQA has no obligation to act on or respond to the public debate, though useful information or advise may affect the thinking of some Members. Once the IQA operations have stabilized, the Members can review the state-of-the-art and add features that can advance IQA performance and better meet the People’s expectations. Note that the issue of Internet voting on the general election ballots is an entirely separate issue. Moreover, there is currently no proven technology that permits Citizens to be identified uniquely and prevent abuse or to ensure “one-vote per voter”. These issues are independent of and not a part of this Planned Solution. The computer system will probably be a straightforward set of a few local area networks on a single domain with single-point fire-walled broadband Internet access. All email, browsers, and faxes should go through specific recording servers so that any misuse or tampering with the IQA or other outside influence may be detected or at least evidence gathered after the fact. A standard suite of office functions should be provided using features with which Members are most likely to be familiar. All host computers should be interchangeable (i.e., central logon and profile), and arranged in a few rooms where Members can have easy but secure access to their user and groups’ information from any host. It will probably be sufficient to start with the number of host computers equal to about a third of the number of Members. The computer system must be capable of entire and safe relocation in about a week, since it will probably be moved periodically to new IQA facilities. Cabling should be kept as unobtrusive as possible without significant structural intrusion or potential hazard. Wireless connections should only be considered if that technology has been used in a similar manner in large financial organizations such as banks and proven truly to be secure without labor-intensive support. It is anticipated that the IQA will let a contract for the computer system operating design, high-level (i.e., minimal hand coding) programming, installation, operation, and maintenance. However, the contract cannot stay with the same company for a long time to avoid entrenched support personnel or organizations. All aspects of the computer system and software must be off-the-shelf generics and standardized to the maximum degree to minimize the learning curve and facilitate inter-application data transfer. A formal hand-written or printed up-to-date hard-copy ledger will be kept of all changes and complete detailed logs will be kept containing all information necessary for a new contractor immediately to manage the system. All key information kept on-site will be stored in a re-locatable high-quality fire safe for general papers, a security safe, and a magnetic media fire safe. A single platform should be used for the efficiency and convenience of the IQA even if this means sole-sourcing all the hardware and software—multiple hardware and software vendors would present onerous complications due to mandated turnover in users, service personnel and locations. The exception to this would be to install a few machines for a small minority of Members who would find the transition to another operating system environment to be an onerous learning curve. However, these exception hosts must only be allowed if they can incorporate applications that enable them to access and write the same data as the other hosts (without any data manipulation or conversion being provided by the IQA’s computer system or not-of-the-shelf software written by the IQA’s consultants). Duplication of data and effort must be avoided. Whenever a group of strangers are gathered together for important business, as with a Jury, their behavior will be variable; that is the way it is in the real world, and the Citizen IQA is made up of a random sample of us. The IQA has the responsibility to maintain reasonable standards of behavior. Members’ oath of duty implies a substantial level of dignity and civility, this will be reinforced by peer pressure, then controlled by our normal societal means and, in the last resort, by expelling a Member. In addition to the facility details specified in the constitutional Amendment and IQA Rules, it is anticipated that the IQA will choose hotel/motel facilities that they will negotiate for one year. They will be located in a pleasant geographic area. Members will need reasonable facilities for normal shopping, recreation, entertainment, etc. A pool of automobiles (not marked or distinctive) should be rented for Members’ use while the IQA is in session. Restaurant facilities will be required. Bedrooms accommodations should each have television and possibly a small kitchen area. Bedrooms will not have Internet access. A year-round pool and gym should be available. Research, study, and computer facilities may be spread through several adjacent rooms. At least 32 rooms will be needed that can seat 15+ persons for small-group deliberation. The fully-equipped main conference room should seat 500+. For security reasons, the main facilities should be such that they can be guarded and access can be restricted. Access via the lobby will be fully monitored. Accessibility will be from interior hallways, and all exits will have no re-entry. Room telephones will be available for outgoing telephone calls only, and they may be monitored; Members will not be permitted to bring cell or portable phones. No internet connections will be provided in the rooms, nor will Members be allowed to bring their own computers, fax machines, or equivalent communications devices. When the IQA is not in Session, the facilities containing their equipment and records will be locked, secured, and guarded. There are some requirements that proposed Initiatives should follow. They are set forth in the constitutional Amendment Section 2, and in the IQA Rules under Content and Format of Candidate Initiatives and Sources. The following table will provide a suggested layout. When the proposed Initiative is published in a newspaper to communicate it to the IQA, all the information must be complete including the certification by a Notary Public. Preamble that provides the background of the Initiative and the need for it. Signatures, Names, Addresses, and proof of Citizenship of: citizens responsible for authoring and sourcing the Initiative, or authorized officers of the organization authoring and sourcing the Initiative. Include specific and assured details how to contact an authorized person and a deputy (including mail address, phone number, fax number, and email address) who can answer any questions, accept any suggested changes, and promptly transmit communications to all the authors in the group. Certification by a qualified and currently licensed Notary Public that the persons named above appeared in person, signed this document, and provided proof of their names, addresses, and U.S. citizenship on this date. Concerned with important confidential issues whose premature publication would be disastrous. Concerned with important confidential issues whose premature publication would be disastrous. Cornerstone of democracy (the other is voting rights). New cornerstone of democracy. Duty of citizenship. Duty of citizenship. Renders a Decision, Jury makes verdict. Renders Selection, Electorate makes verdict. Considers a series of cases. Considers a continuous series of proposed Initiatives. Federal Grand Juries have between 16 and 23 Jurors. 480 Members—20 times larger than Jury. Duration of duty average one year, but up to 36 months. One year only, staggered so 1/12th resign every month to ensure continuity. Replacements by alternates or choosing new jurors. Replacements selected every month to cover those resigning and those excused. Lay persons decide momentous issues. Lay persons decide issues that may later affect the nation depending on the nationwide vote. Sit for about 5 days per month, weekly, monthly or on call depending on workload. Sit for about 5 days per month depending on workload. The identities of the grand jurors are secret. The identities of the IQA members are secret for two to five years after they are selected, but may then be made public if a member wishes. Grand Juries meet in private. The IQA meets in private. Grand Jury proceedings are recorded. IQA meetings are recorded and Plenary Sessions are videotaped and made public two to five years after the event. Secrecy protected by Rule 6(e) of the Federal Rules of Criminal Procedure. Secrecy of evidence and witnesses may be kept for long periods. Protected by similar rules of secrecy, but only for two to five years after the event. Everything is then made public to permit the People to assess the performance of the IQA.